To begin the booking process please review our How to Book a Party page, then fill out our Pre-Party Questionnaire! Every party includes a special gift for the guest of honor! Please view our Add-Ons page to read more details about the Add-Ons available for your party. Multiple characters may be requested for an additional character fee, view the prices by clicking here. Multiple character requests will be fulfilled whenever possible. The options below are for parties with less than 15 children. If you will be having 15 or more children at your party please review our Large Party Options. 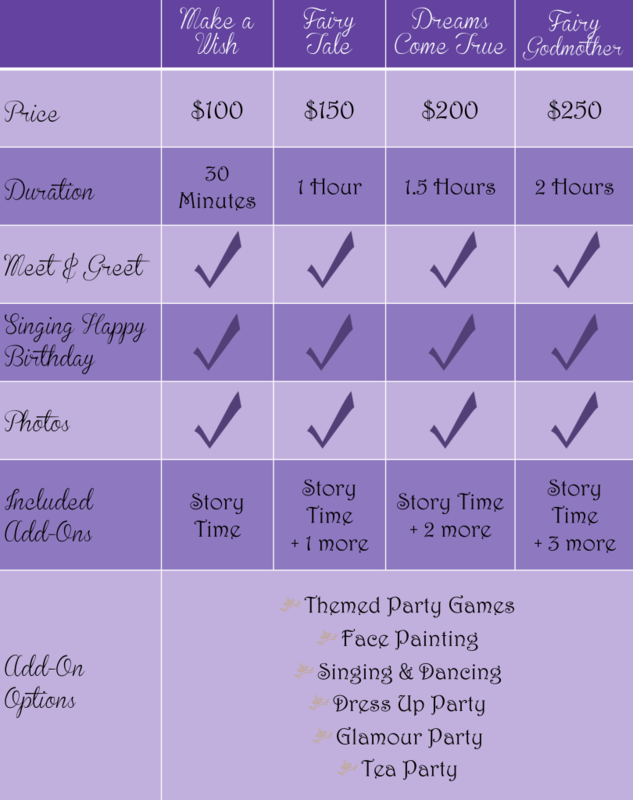 The listed prices include 10 party guests and include one character of choice. For parties with more than 10 children, a $3-$10 fee per child will be applied (depending on which Add-On’s are selected).